Los Angeles City Councilman Richard Alatorre (in grey suit) presents resolution to (left to right) MNC Editor-in-Chief Roger M. Grace, MNC Assistant General Manager Vahn C. Babigian, MNC Vice President and General Manager S. John Babigian, and MNC President Jo-Ann W. Grace. Roger M. Grace, president of MNC's parent corporation, extends thanks to the 15 members of the City Council, all of whom signed the resolution. 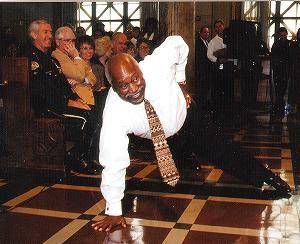 Los Angeles City Councilman Nate Holden enlivens the ceremony by demonstrating several one-handed push-ups. The Metropolitan News Company's 20th anniversary of newspaper operations in the City of Los Angeles was marked Friday by a Los Angeles City Council proclamation presented at a City Hall ceremony. Councilman Richard Alatorre presented a scroll, signed by all 15 council members and by Mayor Richard Riordan, to MNC President Jo-Ann W. Grace during the regular council session. "I believe your newspapers provide an invaluable service throughout Los Angeles and the state." The resolution recited that Oct. 3 "marked 20 years from the date of the first issue of the Metropolitan News-Enterprise to be published under its current ownership, Grace Communications, Inc."; that MNC publishes three newspapers in the city of Los Angeles: the Metropolitan News-Enterprise, the Civic Center NEWSource and the Los Angeles Bulletin, as well as four newspapers in other counties; that it publishes rules of court of the state and major counties; and that it owns Capitol News Service, and two legal advertising agencies, Cal-Net (California Network of Community Newspapers) and NNN (National Newspaper Network). 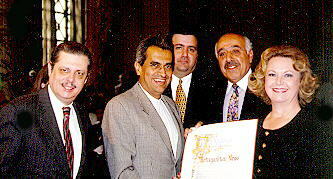 The resolution proclaimed that "MNC covers law, the courts and local government in a comprehensive and outstanding manner which put them in the forefront of governmental issues in the City of Los Angeles and the State of California," that "MNC's coverage throughout the years has become an indispensable tool for lawmakers and jurists statewide" and that "MNC provides in-depth governmental coverage throughout the State of California." 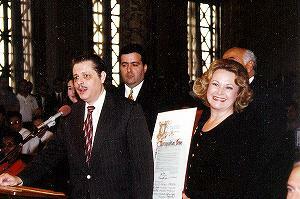 "NOW, THEREFORE, BE IT RESOLVED, that the Mayor and Council of the City of Los Angeles do hereby commend the METROPOLITAN NEWS COMPANY for its 20 years of outstanding journalism and coverage of local and state government, and its current ownership, Grace Communications, Inc., for upholding the highest journalistic standards and for fostering a better understanding of government and its role within our communities." MNC Editor-in-Chief Roger M. Grace extended thanks to Alatorre for the scroll. The Graces were flanked by their daughter, Lisa Grace, General Manager S. John Babigian, and Assistant General Manager Vahn C. Babigian. "Reaching a 20-year anniversary in business is certainly a feat," Grace said, but noted he had heard there was a member of the City Council who could perform a greater feat: doing one-arm push-ups. With that, Councilman Nate Holden performed a series of one-armed push-ups on the council floor to a mixture of amazement, cheers, laughter and applause from the other council members and the hundreds of audience members. Later, Holden commended the company's newspapers for their accuracy in reporting on Los Angeles. "I'd like to thank and commend the Metropolitan News and Roger Grace and his family for making a significant difference in the city and the way politics is reported," he said.